Recognizes a phosphor-protein of 45 kDa, identified as MyoD1. Recognizes a phosphor-protein of 45 kDa, identified as MyoD1. This MAb does not cross react with myogenin, Myf5, or Myf6. Antibody to MyoD1 labels the nuclei of myoblasts in developing muscle tissues. 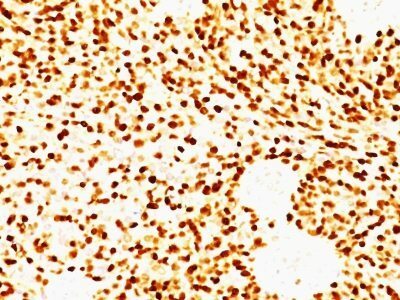 MyoD1 is not detected in normal adult tissue, but is highly expressed in the tumor cell nuclei of rhabdomyosarcomas. Occasionally nuclear expression of MyoD1 is seen in ectomesenchymoma and a subset of Wilm s tumors. Weak cytoplasmic staining is observed in several non-muscle tissues, including glandular epithelium and also in rhabdomyosarcomas, neuroblastomas, Ewing s sarcomas and alveolar soft part sarcomas. Catalog number key for antibody number 0712, Anti-MyoD1 (MYD712) The prefix indicates conjugation, followed by the antibody number and size suffix.